Rose Blossom Legacies: June Specials and Classes - It's Stampaganza Time!! June Specials and Classes - It's Stampaganza Time!! I am so stinkin' excited that I can hardly stand it!! 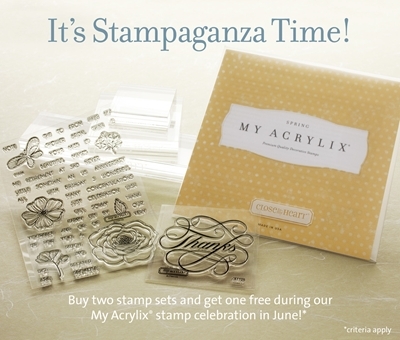 The June Special is Stampaganza! Buy two stamp sets and get one free! I love when this special comes around because it helps all of you that have been pining over stamp sets purchase them even more affordably. You know, I have to say that our stamp sets are already at an amazing price point. But when you get one free, that's like adding whipped cream and a cherry to your pile of frosted cake and ice cream - it's just all the sweeter! It's so simple, but let me give you the specifics. For every two stamp sets (A, B, C, D, or E) that you purchase at regular price, you will receive one of equal or lesser value FREE! This is a savings of up to $29.95! I know a lot of you that have been looking at the E-Sized Alphabets (pages 29, 36, 48, and 113-118) for your page titles and monogram cards. I also know that a lot of you have been wishing to get some sentiments sets for your card making. There is no better time than June to buy your stamps! 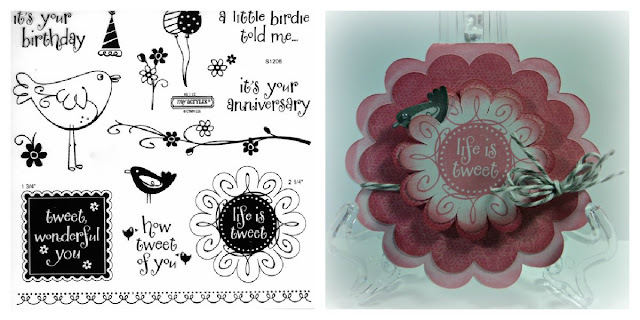 You know, when your order totals $50 or more, you can also buy this CUTE stamp of the month, Life is Tweet, for just $5.00! 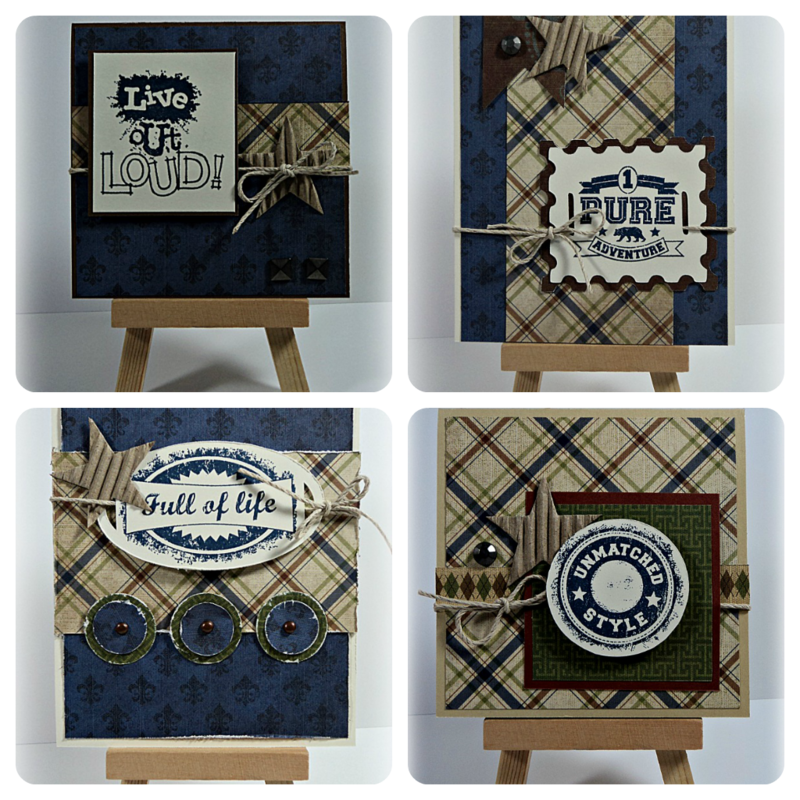 This kit consists of 4 masculine cards. The last day to order this kit is Monday, June 11th, and cards will mailed on June 12th. I want to have them to in time for you to use for Father's Day, so the deadline for ordering is a bit earlier this month. You can pay via PayPal or check, and the cost is $6 delivered to you. If you pick the cards up, the cost is $4 per kit. All cards come pre-stamped, pre-stamped with instructions and envelopes. In this class, we will be using ink pads, watercolor pencils, waterbrushes, and a blending pen to create 4 beautiful cards. I know that you are going to love using these techniques! 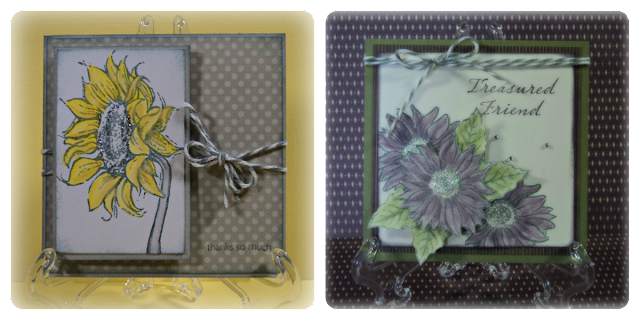 This class includes 4 cards, all the pre-cut papers and supplies, and you will take your blending pen home with you. These are two of the cards we are making, and the other two will be shown in class. I will also have a special sale on one of the stamp sets that we use in class. These classes will fill up very, very fast, so reserve your spot early! You are also able to purchase this kit long distance at the cost of $25. It will come to you pre-cut, sorted, and stamped along with a photo of the layouts. Please order by June 10th so that I can prepare for you! June is GREAT time to invite your friends in for a Gathering! It's a casual afternoon or evening of fun where everyone gets to leave with a free creative project, and you earn Hostess Rewards. I have a few dates left and would love to share this special with your friends! Are you long distance? No problem! We can do a Party in the Box where you will get everything you need to have a home or book party. In addition to Close To My Heart's generous Hostess Rewards, all of my June hostesses receive a FREE stamp of the month, a handmade gift, and a free paper packet! Please contact me today for more information. You can call or text me at (763) 227-0583 or e-mail me at girlygirlrose43@msn.com. I would love to hear from you! Awesome specials. Your classes are over-the-top amazing!